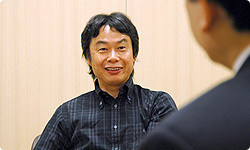 For this last instalment, I’ll be interviewing (Shigeru) Miyamoto-san, the creator of Mario and the person in charge of the game design for Super Mario Galaxy. 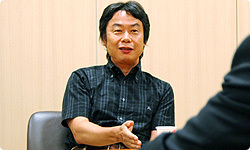 Miyamoto-san, there are so many things that I would like to ask you in this interview. 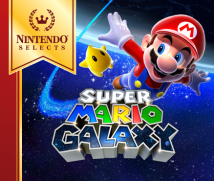 To start things off, I would like to ask you about the Co-Star mode, which is a very important element of Super Mario Galaxy. The Tokyo staff really worked hard to make the Co-Star mode into the great shape that it is in now. I think the issue of two-player simultaneous gameplay has been a long-term challenge for you as the creator of the original Mario Bros. Back when I was working on Kirby’s Fun Pak for the SNES at HAL Laboratory, taking on this challenge from you resulted in the creation of the game’s helper system. That’s right! (laughs) Two-player simultaneous gameplay definitely was a challenge that was on my mind all these years. That’s why I worked on the Mario vs. Luigi mode１ in New Super Mario Bros.2 for a very long time to make it the way it is in the finished product. 1 Mario vs. Luigi is the two-player competitive mode playable in New Super Mario Bros.
2 New Super Mario Bros. is a side-scrolling action game that was released on the Nintendo DS in Europe in June 2006. So, with the creation of the Co-Star mode do you feel that you’ve finally successfully solved this challenge that has spanned about 25 years since the birth of Mario Bros? But there’s a part of me that’s difficult to please. Though I was happy to hear the staff suggest new ideas, on the other hand, I also thought that they were taking it lightly at times. You knew that it wasn’t going to be so easy. Right. There were times I even told them off for it. But even though I said it wasn’t going to be so easy, I really wanted to overcome this challenge. As the pointer had become available to use with Wii, I started to put into place piece-by-piece the things that I wanted to do in two-player simultaneous play using that feature. I’d heard that towards the end of development, you had clearly defined what you could do in single-player mode and what you could do in two-player mode. The single-player mode had become very complicated, so we removed some of its features and moved them to the two-player mode. Doing so cleared things up quite a lot. Friendly two-player play is something that’s easier said than done. It’s not a problem in competitive play where the two players are equal, but in scrolling games where one player is the main player, the question of whether the other player could really enjoy the game was just one long-term challenge. With those games, it always seems like the second player is being forced to play, and at times it’s not much fun. If the first player is enjoying the game much more than the second player, the second player is just playing to make the first player happy. That’s right; you end up playing just to entertain the other player. That’s why I wanted to make it so that the second player could enjoy the experience as well. Of course, people who play together usually have some sort of relationship with each other and that relationship helps make up for this problem. For example, two good friends can have fun no matter what they play. But I wanted the second player to also be able to enjoy action games for what they were. So, by making good use of the Wii Remote’s pointer, I think we were able to have the second player play the game with a very strong sense of participation. During the initial stages of development, we’d made it so that the person assisting the main player was able to do things like shake the Wii Remote to make Mario spin or make him jump by pressing A, but we ended up taking those features out because it lent itself to negative play and made play difficult. Getting in the other players’ way can be a fun part of gameplay, but I think that with Co-Star mode, which also includes functions to entertain the other player, we were able to finalise the style of the two-player mode. I heard that you had a lot of people from the general public come and try out this game. Quite a lot. We had parents and children come together so they could play together, we had people over 50 play the game – oh, come to think of it, I’m actually also over 50 myself... Anyway, we had a lot of people play the game, and we observed them, had them write about their impressions, things like that. I analysed those reports as I read them, noting things like how people might have written “It was fun,” but they didn’t look like they were having fun, or how some people wrote how they enjoyed the game more as the levels had become harder. How do you imagine people will be playing with Co-Star mode? What I originally had in mind were situations like a parent sitting by their child – for example, a mother assisting her child. I also think it would be great if the opposite happened. I had a very strong image of the mother controlling Mario, while her child assisted her saying things like “Mum, there’s an enemy over here!” A parent and child helping each other while they play was something that I wanted to make reality for a long time, and with Super Mario Galaxy, I strongly feel that situations like this could really happen. So I think there’s a benefit to sitting next to a beginner and showing them how to play, and I think the two could have all sorts of conversations with each other as they play. I think for people who aren’t used to 3D games, being able to use the pointer and tell them things like “This way!” lets them play in a “field” that hasn’t existed up until now.